Do you like it? When do you think it will be released? Tomorrow we will have another round of Protectosaur meetings. In case you aren’t familiar, Protectosaurs (and non Protectosaurs) are encouraged to meet once a week if possible, to discuss different things to come, and that are going on around the island. There’s a new mod. Their name is ModosaurTaurus. Here is what he/she looks like. I found them while ModosaurOperarius was showing them around. Have you met Taurus yet? 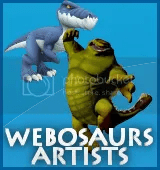 A new mod, named ModosaurWackyMo, will be coming online this weekend. They will be holding a contest, where you will be able to win a 1 month membership. WackyMo will be hiding in a random place between 13:00 and 15:00 WST on Saturday and Sunday. All you need to do is be the first to find him/her and ask, “Who is the wonkiest of them all?” Then, WackyMo will give you an answer, which you’ll need to leave as a comment on the blog. 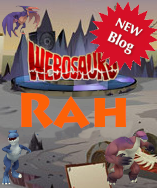 The two dinos that find WackyMo first, the most times, will win a one month membership. If they’re a member already, they can choose an item instead. Moon has finally updated the blogroll, and here is what it looks like now. 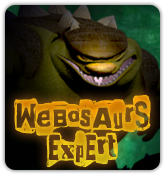 Our blogs name “Webosaurs Expert” and link http://webosaursexpert.com/ have finally been fixed on the blogroll, so you can get here through there now. 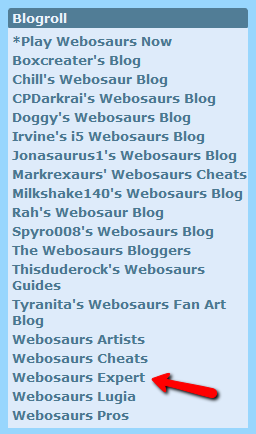 A few blogs were added, and a few blogs still need to be removed from the blogroll. Hopefully Moon will fix it up soon. There’s a new mod. Their name is ModosaurHystrix. Do you know if they are a boy or girl? Wow, we had over 210 guesses in the number guessing contest! The winners are…Dukster and Mimp! Congrats guys, I’ll send you your code soon! Comedy night wasn’t as bad as it was last time, thankfully. The muscles theme made it tough to come up with good jokes, but there were still some good jokes. Here are our winners! Congrats to the winners. Did you have fun at the comedy night? It’s time for our weekend parties! This weekend, Horns from the horrible Team Webo is coming to the island TWICE! First, on Friday, Horns will be bringing back a Comedy Matinee! This time, the theme is Muscle Jokes, and I’ve got a really good one. Here’s the joke: HORNS’ MUSCLES. HEEHEE. Then, on Sunday, we’re having a brand new type of party! Horns is going to be back to play a new game with us, which he calls King of the Geyser. The point of the game is to get as close to the Geyser as possible without getting lifted off to Dr. Nanosaurus’ Lab. The winners of this game will get the rare Weight Lifting set. Comments Off on Weekend Parties!